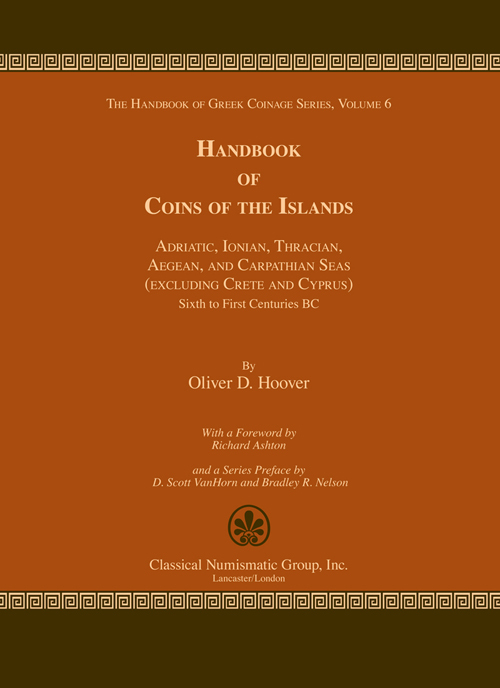 Hoover, Oliver D. Handbook of Coins of the Islands: Adriatic, Ionian, Thracian, Aegean, and Carpathian Seas (excluding Crete and Cyprus), Sixth to First Centuries BC [The Handbook of Greek Coinage Series, Volume 6]. 2010. lxxxii and 358 numbered pp. Hardbound. (GR) (GR 335). The third published volume in the series is Handbook of Coins of the Islands: Adriatic, Ionian, Thracian, Aegean, and Carpathian Seas (excluding Crete and Cyprus), Sixth to First Centuries BC (Volume 6 in the series). This volume contains not only many extreme rarities and issues of some of the more obscure islands, but it also includes most of the major island mints like Thasos, Aegina, Rhodes, Kos, and Samos. This volume is arranged geographically from the Adriatic Sea eastward to the Carpathian Sea, from north to south, and with each island entry within each sea in alphabetical order. The coinage within each city is arranged chronologically, beginning with the Archaic issues and continuing through the later civic issues in the name of Alexander. Where rulers or cities issued coins concurrently in all three metals, these issues will be arranged in the catalog with gold first, followed by silver, and then bronze; each metal is arranged by denomination, largest to smallest.